Cardamom is native to the East, originating in the forests of the Western Ghats in Southern India, where it grows wild. Today it also grows in Sri Lanka, Guatemala, Indo China and Tanzania. Cardamom is regarded as the Queen of Spices and is in the more expensive column of the spice table. Cardamom spice comes in different variations as well. Green cardamom, also known as true cardamom, is the most common variety. Cardamom is brown and slightly elongated. In the culinary arts, cardamom is a spice made from the seed pods of various plants in the ginger family. 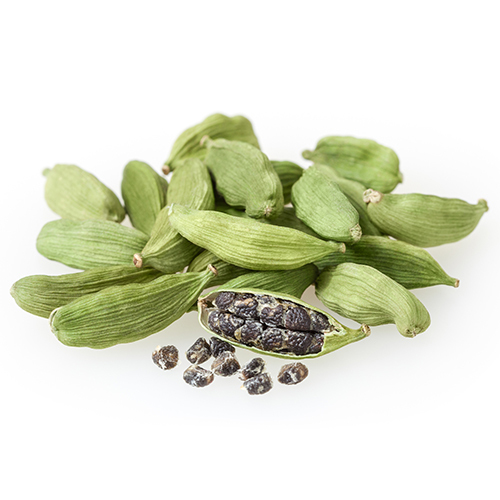 Cardamom has a strong, pungent flavor and aroma, with hints of lemon, mint, and smoke. nction with nutmeg). And don’t forget drinks: everything from mulled wine to hot cider to eggnog will benefit from an unexpected hint of cardamom. It’s merely a short culinary leap to say that cardamom can be used in any of your usual autumn and winter recipes””whether it’s spice cakes, puddings, casseroles and pear or apple tarts. Cardamom grows best in a warm humid place where there is plenty of rain and rich soil. The tree produces flowers after it is 2-3 years old. The first crop of seed capsules is harvested in the third year after planting. In India, the tree flowers in April/May and continues until July/August. The seed capsules are harvested at 30 to 40 day intervals. Â Harvesting at the correct stage of maturity is essential to produce high quality cardamom capsules. The fruits should only be harvested once they are fully ripe and mature. In some places, farmers harvest the crop before it is fully ripe because they worry that it will be taken by thieves. If the crop is picked when it is mature, the higher yields and higher value of the final product may offset the losses due to theft. A ripe capsule has black seeds inside. An immature capsule has white seeds.